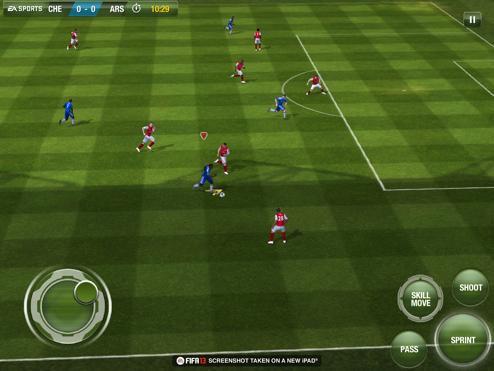 Rain and user friendly substitutions are but two new features in EA Mobile's football sim. There are plenty of FIFA fans in the U.S., but by and large, the country doesn't seem to grasp the worldwide phenomenon that sees crazed shoppers in multiple countries flooding stores for midnight openings. Suffice to say, it's an incredibly huge sports franchise, one that's not only popular on consoles, but also mobile devices. Hence the need for FIFA Soccer 13 on iPhone and iPad. EA Mobile has seemingly cooked up a worthy handheld edition, one that comes with a bevvy of new features. From what we've seen, the theme of this year's entry involves giving the user more control, starting with the ability to select which stadium he or she wishes to play in, as well as weather conditions, be it sun, clouds, day, night, clear or rainy. In addition, FIFA Soccer 13 comes with an instant replay function that lets gamers zoom in to get a better look at each virtual player. On top of that, they're free to adjust the camera for unique angles of different plays. Meanwhile, a revamped team management feature allows for near effortless substitutions, where swiping is all it takes to make a change on the pitch. This may pale in comparison to the heart of FIFA Soccer 13, EA Sports Football Club. Here, players earn points during play that get transferred to a universal account shared through all versions of the game across every single platform; in other words, what you do in the iPhone and Xbox 360 editions are one in the same. Then, these points help them climb the leaderboards. They can even receive updates on their friends' exploits. On the field gameplay was also improved. Now, players are able to call a second defender that immediately tracks down the ball; this is a great way to double team rivals. Finally, gamers can swipe the screen to change how their teams play, where swiping right attacks offensively, and swiping left puts a heavier emphasis on defense. Of course, the more things change, the more they stay the same. As such, EA wisely brought back the option to use the iPhone as a controller while viewing the action on the iPad. 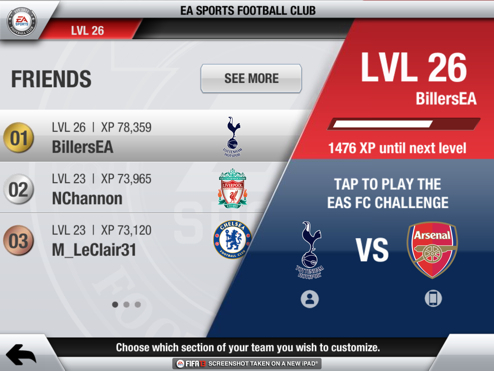 Combine that with the new features and hundreds of clubs to select from, and FIFA Soccer 13 may offer a premier football experience when it debuts on the App Store this fall.